AOL PFC file Converter provides facility to transfer AOL PFC to Outlook in a trouble-free manner. Tool exports AOL contacts to Outlook, maintaining data integrity after conversion. AOL desktop email client can easily export their files in PDF file format to make these file easy to access and portable. Personal filing cabinet files can easily be migrated to adobe format for user convenience. To export AOL PFC to Outlook of particular date range, user can able Date Filtering option and then mention the From – to –To date. 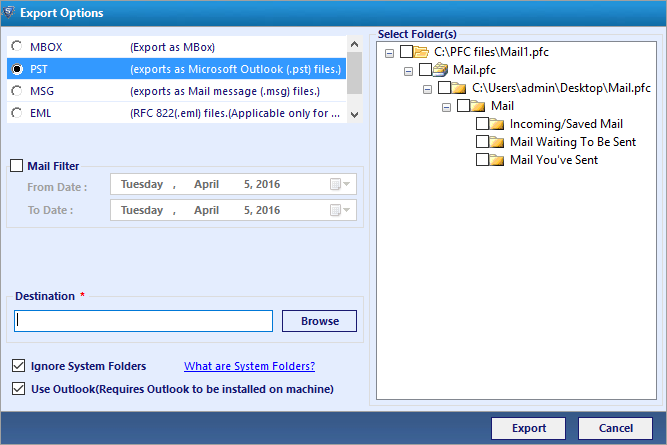 Software can convert PFC to Outlook with various PFC files at once. The PFC to PST converter provides batch migration without any interruption. Tool enable feature to convert PFC to PST selectively i.e. if user wants to convert particular mails or only a folder then they can perform selective selection of mails/folder. To save the Output file in customized manner, tool enables its user to convert PFC file and archive it by user-defined name. 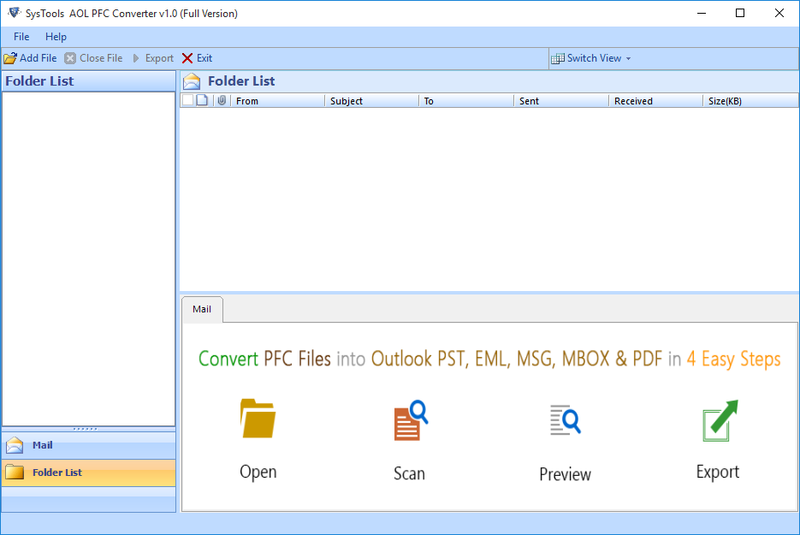 However, to deal with contacts user can export AOL contacts to outlook using this application. Trial version PFC Converter Tool Export first 25 items per folder of PFC file to PST/EML/MSG/MBOX/PDF format. Support: Windows 8.1, 8, 7 & all below versions of Windows. Microsoft Windows – 2000, 2003, 2008, 2012, XP, Vista, 7, 8,10 (32-bit & 64-bit). How to backup AOL PFC files using PFC file converter? Convert AOL PFC to PST/PDF for backing up your AOL PFC files on local machine using this tool. 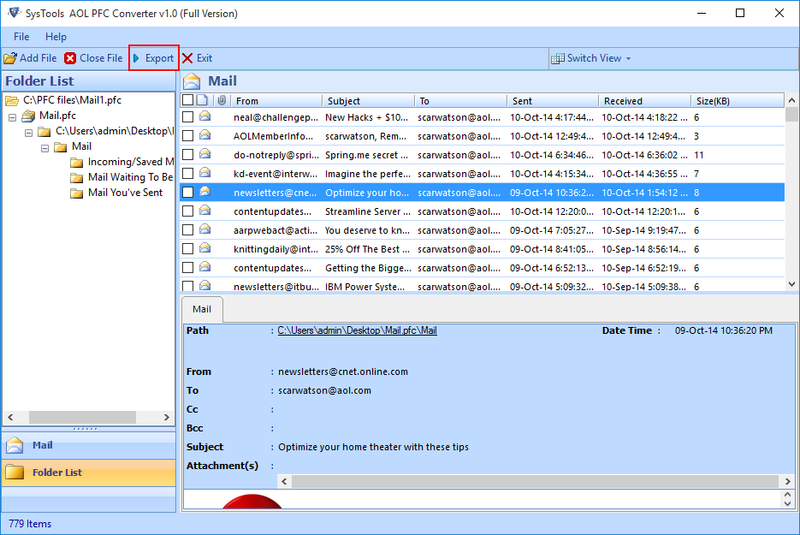 Can tool export AOL mail folder to Outlook maintaining folder integrity? 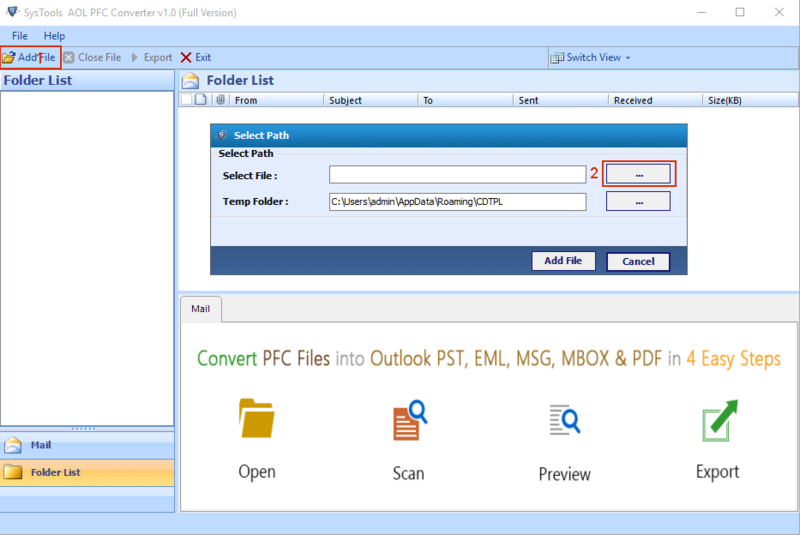 Yes, convert AOL PFC file to Outlook PST/EML/MSG/PDF file format by maintaining folder integrity. Can I transfer AOL email to Outlook without MS Outlook application? No, you cannot convert AOL PFC file to Outlook without MS Outlook installation. Can I export AOL mail folders to Outlook in a selective manner? Yes, you can export AOL emails to PST/PDF/MBOX/MSG file type in a selective manner. How to convert AOL PFC files was the question bothering me since last one week. 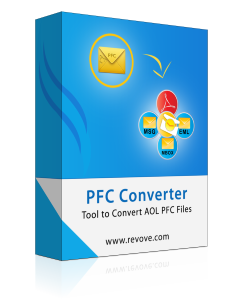 Recently I came across PFC file converter, which smoothly backed up my mails and contacts. Thanks to software developers for initiating such a flawless converter. I am accessing AOL application since last 2 year and now wanted to switch to MS Outlook application. I was searching for solution of how to export AOL PFC, which maintains the data integrity after conversion. PFC Converter is that software for me and working with it was a great experience.